Oregon Pinot Thrill or Overkill? Growing Pinot Noir along the most western reaches of the Sonoma Coast might be regarded as pure folly to many, but the dedicated band of “wild men” who have accepted the challenge know that the fickle grape feels right at home here. This region is quickly becoming one of the epicenters of Pinot Noir in California. The Sonoma Coast AVA (American Vineyard Appellation) is the largest of the 13 AVAs in Sonoma County at 750 square miles. This cumbersome AVA was formed in 1987 primarily to allow certain wineries to include all of their scattered major vineyards within one boundary so they could use the “estate bottled” designation on their wine labels. The Sonoma Coast AVA is defined by its coolness, with no more than 2,800 degree days of heat during the growing season. It is sandwiched between the mountains and the Pacific Ocean, and with its high winds, daily fog, and cold temperatures, is a hostile environment only Pinot Noir could love. The vineyards are positioned either above or below the fog line or in microclimates where the wind blows off the fog. There are an endless number of mesoclimates and soil types in the Sonoma Coast AVA, but the common denominator is the coolness. 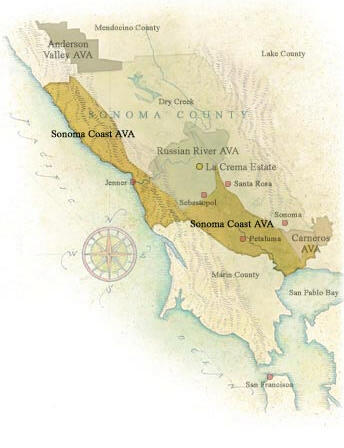 The Sonoma Coast AVA extends from the Sonoma County border with Napa in Carneros to the east, to Marin County to the south, to the Pacific Ocean in the west, and to the Russian River Valley AVA boundary to the north (refer to map on page 2). It overlaps five other AVAs including the Sonoma part of Carneros, a sliver of Sonoma Valley, the western part of Chalk Hill, all of Green Valley, and most of the Russian River Valley. Because of the unwieldy immensity of the Sonoma Coast AVA, it has been unofficially subdivided into the “true” or “real” Sonoma Coast. This subdivision is roughly from Jenner in the south where the Russian River empties into the Pacific Ocean to Annapolis in the north and from the beaches to 5-6 miles inland including the first two ridges of the Coastal Range of mountains and the west slope of the third ridge. Besides Annapolis and Jenner, usually Ft Ross, Occidental and Freestone are included although all are south of Jenner. Eventually, the true Sonoma Coast will be broken into smaller AVAs. A small portion, the Ft Ross Seaview area, above 920 feet elevation, applied for its own AVA in 2003. Regardless of how it is currently outlined, the region is defined by its extreme coolness which makes ripening Pinot Noir before the Fall rains come a challenge. The price of land has gone from $4,000 an acre to at least five times as much in the last decade. The price is misleading and in reality much more expensive than the amount suggests because the landscape does not lend itself to farming. A winegrower might have to purchase 50 acres to get just 10 acres suitable for farming grapes. Much of the area is too hostile and too steep for grapevines. Another hurdle to farming here is the local residents, who although sparse in number, are quite rabid in their opposition to development in this region. Mike Bohan was the first to plant grapes in the true Sonoma Coast. In 1973, he developed a vineyard on Bohan Dillon Road which included Zinfandel, Pinot Noir, Chardonnay, and Riesling. To this day, the Bohan Ranch sells all of its grapes. The list of subsequent pioneers in the true Sonoma Coast region reads like a who’s who of California Pinot Noir. The names include Helen Turley and John Wetlaufer (Marcassin), Lee Martinelli (Martinelli), David Hirsch (Hirsch Vineyards), Bill Smith (W.H. Smith), Ted Lemon (Littorai), Walt and Joan Flowers (Flowers Winery), Mark Bixler and Steve Kistler (Kistler Vineyards), Ross Halleck (Halleck Vineyards), and Daniel and Marian Schoenfeld (Wild Hog). More recently, there has been considerable interest in the Sonoma Coast by several prominent Napa wineries including Caymus (Belle Glos), Pahlmeyer, Peter Michael, and Joseph Phelps (further information later in this issue on the Phelps project). Crops in the true Sonoma Coast can be very small depending on the vintage. In 2005, for example, some vineyards were decimated by rain during bloom and several vineyards yielded less than 1/2 ton per acre. The main cause for this was poor set in the spring. Another difficulty is that the vines grow very slowly in the region, and it can take at least an extra year or two for a vine to advance from the initial planting to a productive phase. (five instead of three years as in other Sonoma regions). Anthony Austin, winemaker at Sonoma Coast Vineyards and resident of the Freestone area, has found it necessary to severely prune back his new estate Pinot Noir vines close to the ground, so as to achieve strong and more vigorous vine trunks in the future (at the expense of much back pain). California historians note that General Vallejo was directed by the government of Mexico to extend Mexico’s frontier in Sonoma County north toward the Russian settlement at Ft Ross in the mid-1800s. Vallejo sent James McIntosh, James Dawson, and James Black to settle land near Freestone and they became the first white settlers in this area. The town of Freestone was named in 1853 after a quarry of sandstone in the locality. By 1872, Freestone had become a terminus for the North Pacific Railroad and a trade center for the area. 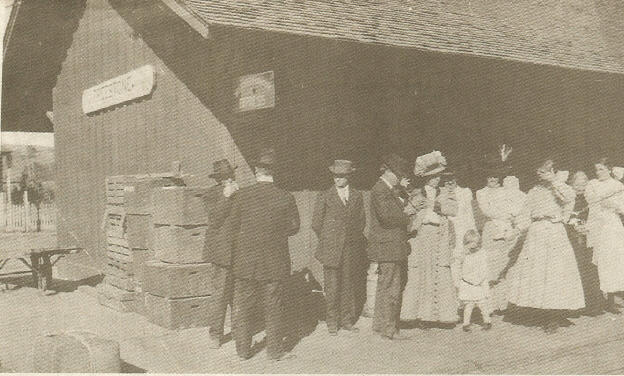 The photo on the next page shows the North Pacific Coast Railroad’s Freestone Station as it looked in the 1900s. A map showing the located of Freestone is also on page 4. The lumber industry eventually dwindled and the railroad was abandoned. This tiny town still has the original 1887 school house and the post office operates in what was originally the town’s general store. Today Freestone is known mainly for two businesses. The Wild Flour Bakery at the intersection of Bohemian Highway and Highway 12 bakes breads in a wood-fired brick oven that are among the best in Northern California. The nearby Osmosis is a world-renowned healing sanctuary in a Japanese-style setting on five acres. The spa is famous for their cedar enzyme bath from Japan. Times are changing in this sleepy, historic town as winegrowers and wineries look to profit from the ideal growing conditions for Pinot Noir nearby. The most ambitious wine project to date is being conducted by the J. Phelps Vineyards family (jpvfreestone.com). In 1998, the Phelps family (known for their Napa Valley meritage, Insignia) purchased 55 acres in Freestone and planted 40 acres to Pinot Noir and 19 acres to Chardonnay at the end of Freestone Flat Road. The Freestone Flat Vineyard was then joined by an additional purchase nearby of the Quail Hill Ranch where additional Pinot Noir is soon to be planted. This vineyard is on a south-facing hillside above the fog line 8 miles in from the Pacific Ocean. Eventually, plantings will total 90-100 acres. The project is a joint partnership between viticulturists Greg Cannon and Phillipe Pessereau, Bill Phelps, Tom Shelton (CEO of Phelps), and winemaker Craig Williams (formerly Williams Selyem). A 40,000 square foot winery in the center of Freestone Flat Vineyard is nearing completion. It is bermed into the hillside and employs gravity-flow via its three level construction. No tastings or tours will be done at the winery due to environmental concerns, but a tasting room is being constructed at the corner of Boehmian Highway and Highway 12 in the old Pastorale Building. The entire project has been fraught with difficulties since the beginning. They principals have spent at least $25 million dollars to date, including a reported $1 million to obtain the necessary permits and pacify local residents. Gophers have been a major challenge and were eating 40% of the new plantings until seven gopher-trappers were hired to eradicate the gophers. Ripening grapes properly in this chilly climate has been a challenge and yields can be ridiculously low due to poor berry set in the cool days of the spring growing season. It is not unusual to have 45 degree temperature swings in a single day here! It is unclear what the final label name will be (Phelps owns the rights to the name Freestone). The first vintage of Pinot Noir produced from Sonoma Coast grapes has been released as the 2004 fogdog Pinot Noir. Fog dog is a bright or clear spot that appears in a breaking fog. This wine contains grapes from three estate-grown vineyards: 70% Freestone, 26% Quarter Moon, and 4% Ferguson. It was aged in 40% new and 60% 1 to 3 year-old oak barrels. (Don’t confuse the name with Radog, a Central Coast Pinot Noir). 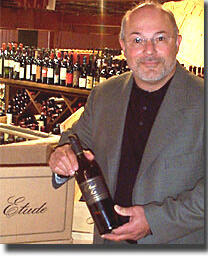 The wine is distributed to fine wine retail stores. 13.8% alc., $30. · The wine takes a while to open as the natural carbon dioxide present dissipates. The nose is unusual featuring pepper, wet leaves, dark chocolate and even exotic wood aromas. Red fruits, particularly cherries, are noteworthy. The finish is short and clean. The big acid spine screams for food. 14.5% alc., $35, This Pinot Noir is sourced from the estate Land’s Edge Vineyard near Annapolis in the true Sonoma Coast. The grapes here are picked in miniscule levels often as late as November. The wine is aged for 11 months in 50% new French oak. The clones are 115, 667 and 777. · Nothing really stands out with this Pinot Noir but it is perfectly fine. There is plenty of toast, cherry and wild flowers in the nose. As it opens with air time, it gets better and better with more structure, Attractive tangy red cherry flavors with dark caramel develop that persist on the back end. The mouth feel is rich and the tannins perfectly assimilated. Hartford Family Wines is located in the Russian River Valley at 8075 Martinelli Road in Forestville. Eight Pinot Noirs are produced, with the single vineyard designates labeled as Hartford Court. The tasting room is open from 10-4:30 daily. The wines may be purchased from the website at www.hartfordwines.com. 14.1% alc., $60. · This baby is a deep dark purple color. The aromas of toasty oak and plump dark cherries waft in the glass. The body of the wine is rich and offers dark black cherries, earth and sage. The smooth finish is outrageous. This is a big wine that is beautifully composed and complete in every way. Delightful! Brogan Cellars wines are crafted by Margi Wierenga, Burt Williams’ (Williams Selyem) daughter. The Pinot Noirs are made from premium vineyards in the Sonoma Coast, Russian River Valley, and Anderson Valley appellations. Production is limited to 1,500 cases and most of the wine is sold through a mailing list (sign-up on the website at www.brogancellars.com). A tasting room is open by appointment at 3232B Dry Creek Road, Healdsburg 95448 (707-473-0211). $75. Del Dotto has quickly become one of the hottest visitor sites in Napa Valley. The winery’s caves, first dug in 1885, have been lovingly restored and the winery offers a candle lit cave experience and barrel tasting by reservation for a small charge. Del Dotto owned 400 acres of vineyards to which 96 are planted to vines. In 2005, an additional 359 acres were purchased in the true Sonoma Coast overlooking the Pacific Ocean. The vineyard, named Cinghiale (Italian for wild boar), was previously owned by W.H. Smith. 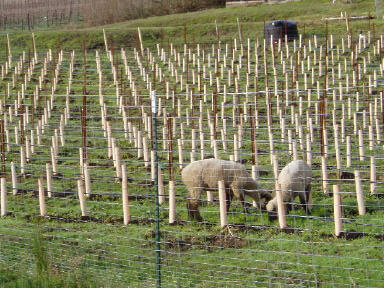 About 35 acres are planted to Pinot Noir. The 2005 is the inaugural release. I had this wine at Cole’s Chop House in the town of Napa. This is a first-rate steak house that has won Zagat’s top rating for a steak house in the Bay Area three years running. I knew Del Dotto was known for Cabernet Sauvignon and other hearty red varietals, so I was surprised to see their Pinot Noir on the list. · The wine was very good. It was a very elegant styled Pinot with nicely balanced Pinot fruits, suede-like tannins, and crisp finishing acidity. It was just fine with steak. Del Dotto Vineyards is located at 1055 Atlas Peak Rd, Napa, 94558. The phone is 707-256-3332 and the website is www.deldottovineyards.com. The Pinot Noir is only for sale to VIP wine club members. Appellations on wine labels indicate where the grapes were grown. Some appellations are more specific than others, with some having a distinctly identifiable and unique combination of terrain, soil, and climatic conditions. Sonoma County stretches from the Pacific Coast in the west to the Mayacamas Mountains in the east and from Mendocino County in the north to Marin and Napa counties in the south. 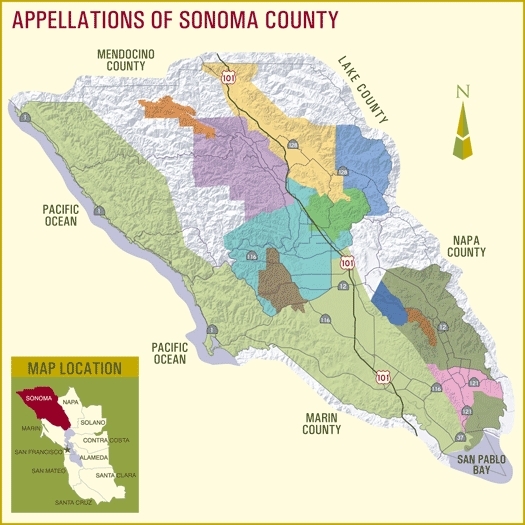 The map below shows 12 of the appellations of Sonoma County. The appellation that is not depicted is the Northern Sonoma AVA which includes several of the other AVAs and encompasses everything in Sonoma County north of Santa Rosa. This appellation exists for no other reason than to allow wineries with vineyards in multiple appellations to label their wines as “estate bottled.” By Federal definition, a winery must be located in the same appellation as the vineyards to use the estate bottled designation. The western Sonoma County AVAs are Pinot Noir country. 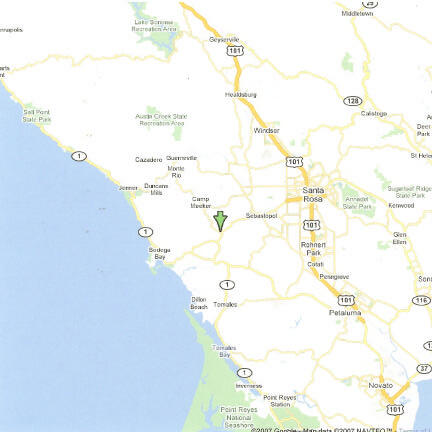 Referring to the map below, they include Sonoma Coast (lime green, 7,000 acres/5 wineries), Russian River Valley (turquoise blue, 10,000 acres/50 wineries), Green Valley (brown, 1,200 acres/10 wineries), and Sonoma Carneros (pink, 8,000 acres/22 wineries). The eastern Sonoma County AVAs include Rockpile (orange, 200 acres), Dry Creek Valley (purple, 10,000 acres/28 wineries), Chalk Hill (bright green, 1,000 acres/5 wineries), Alexander Valley (yellow, 15,000 acres/28 wineries), Knight’s Valley (blue, 2,000 acres/2 wineries), Bennett Valley (dark blue, 850 acres/2 wineries), Sonoma Valley (dark green, 13,000 acres/42 wineries), and Sonoma Mountain (dark orange, 800 acres/3 wineries). Some Pinot Noir is grown in specific sites in the Sonoma Valley and Sonoma Mountain appellations. If an AVA is named on a label, at least 85% of the wine’s grapes must originate from that AVA. Tony Soter has left the Napa Valley to devote himself full-time to his Soter Vineyards label in the Willamette Valley. He wants to concentrate on developing his Mineral Springs Pinot Noir Vineyard. He will continue to consult for Napa Carneros winery Etude, but Etude will be under the direction of winemaker Jon Priest on a day to day basis. Oregon winemakers and Georg Riedel have spent two years in research, evaluation, and comparative tastings to design a new shape of wine glass especially for Oregon Pinot Noir. The idea sprang from a conversation between International Pinot Noir Celebration Executive Director Amy Wasselman and Georg Riedel. In a workshop format, winemakers, wine writers, and sommeliers evaluated a number of Riedel glasses. The Vinum Extreme was found to focus the beautiful aromas of Oregon Pinot Noir, but on the palate, the Grand Cru Burgundy glass was the clear winner. The Grand Cru glass highlighted the velvety texture of Oregon Pinot Noir and softened the edges of younger wines. After preliminary tastings, a number of Oregon’s best Pinot Noirs were shipped to Austria for Georg Riedel to work with at his facility. The final glass chosen was a large-bowled, tulip-shaped glass that glares out at the top. This glass was presented along with eleven others in a subsequent workshop. Tasters agreed that the slight flared opening of this glass seemed to focus aromas and its flared lip reproduced the mouth-feel tasters had experienced with the Grand Cru Burgundy glass. The glass will be officially unveiled at this summer’s International Pinot Noir Celebration in McMinnville, Oregon on July 27-29, 2007. For details phone 800-775- IPNC or consult the website at www.ipnc.org. A picture of the new stem was not available at press time.